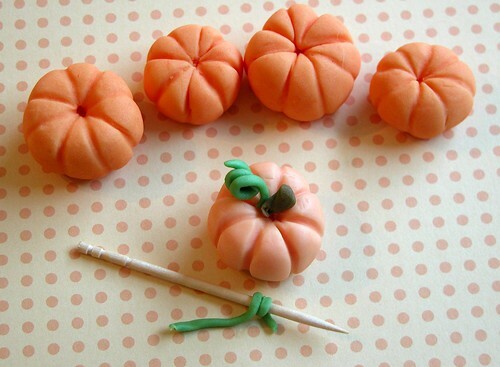 A couple of weeks ago, I decided to have a go at making some cute little pumpkins to go on top of Halloween cupcakes. 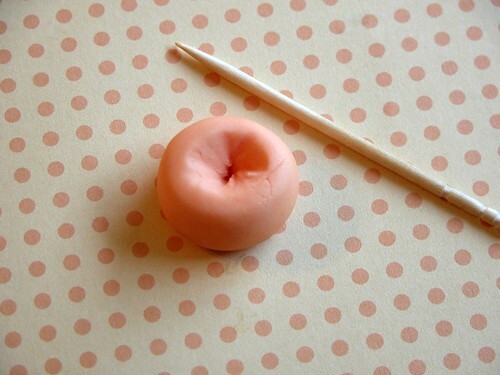 If you have orange fondant, well, you’re one step ahead… Hurrah! 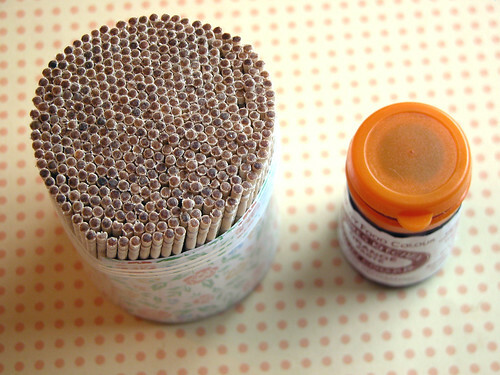 If you want them to be hard, you should make them a couple of weeks before when you need them, so you can sit them in a cool, dark place to set. 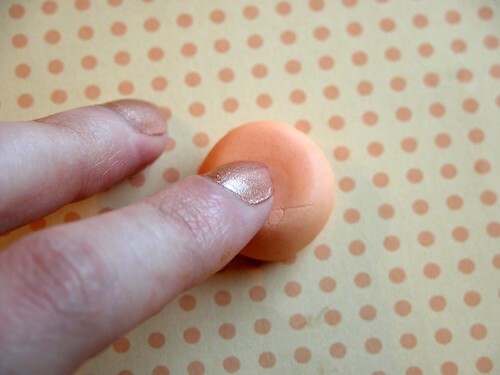 First of all, roll your fondant into a small ball, then squash it down so it makes an oval. This will give it a much more interesting shape than a plain old sphere. Now it’s time to use your specialist equipment. First of all, pierce the centre to mark it. 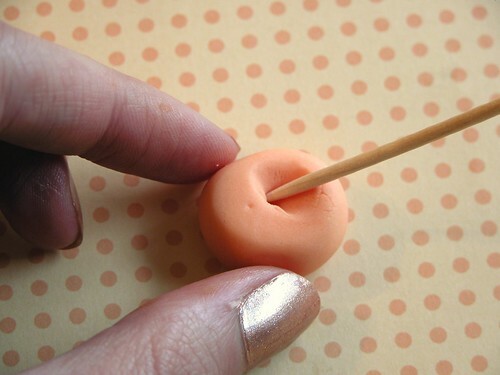 Then, rolling the toothpick, create a dimple in the centre of your ball. There you go – now you’ll have what looks like an orange doughnut gone wrong. 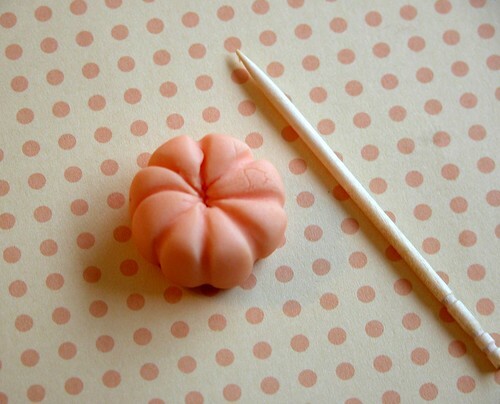 Now, use your toothpick to create lines from the centre down the edge of your pumpkin, using a rocking motion. I do this by doing the four compass points, then filling in the spaces in between. Like so! With the heat of your fingers, your pumpkin might get a little floppy. You can fix this by placing it in the fridge at any point if it starts getting hard to handle. Don’t be a pushover for a vegetable made of sugar. That’s pretty much it! 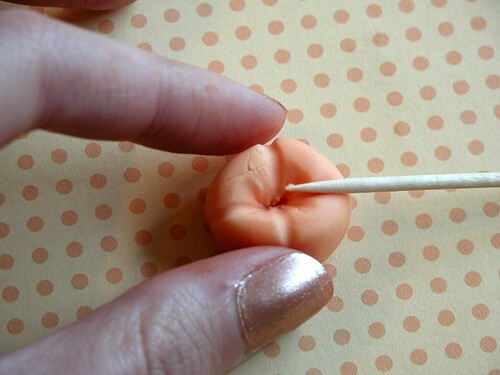 You can add a stalk (I’ve seen people use cloves for this, but obviously they’re not really edible like that) or even make a curly vine from green fondant curled around a matchstick. Too cute to eat? Never! so cute and so simple! I have got to try this out! love the blog. 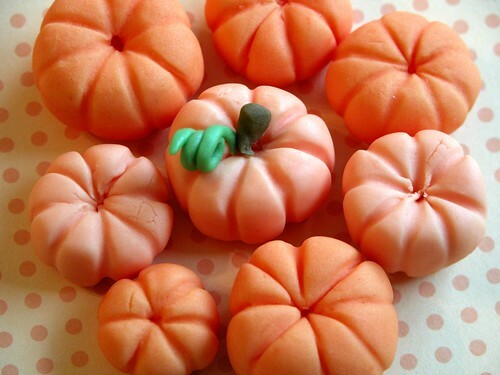 These pumpkins are soo adorable! Great tutorial. So cute! I’m so bummed I only just saw this now. Next Halloween!